Julia Schwob, 1987, grew up in a very musical family and received her first violin lessons at the age of 6. She professionalised her musical knowledge in numerous orchestras at home and abroad and studied under teachers such as Herbert Scherz, Kwang-Ho Lee, Richard Kraggerud, Benjamin Schmid, Gottfried von der Golz. She has also been a part of many ensembles playing various styles of music as both a soloist and concertmaster. A year after obtaining the Matura at Kunst und Sport Gymnasium Rämibühl, Julia finished her Bachelor of Arts studies at the Zürcher Hochschule der Künste and continued with a Masters degree in pedagogy under Ulrich Gröner which she finalised with distinction and won a foundation prize for. For the past seven years the versatile violinist has now also taken a keen interest in the baroque violin. Julia Schwob has been teaching violin lessons at the Kantonsschule Zürcher Oberland since 2011 and works for many ensembles and chamber music formations as a freelance musician. In June 2014 she successfully completed her Master of Performance studies at the Berner Hochschule der Künste under Monika Urbaniak. Her current focus is on historical performance practice and on working with various musicians aswell with artists from the independent scene on experimental projects. 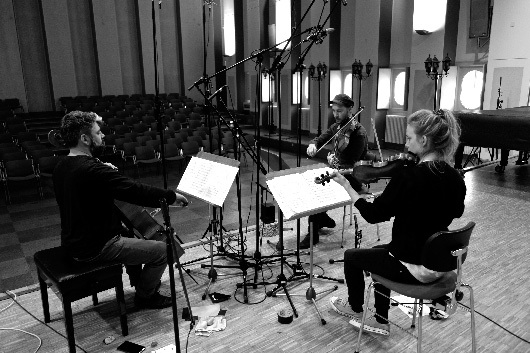 David Schnee, born in 1980, is a freelance violist, who studied in Bern and Zurich. A most versatile musician, he pursues musical projects which range from chamber music, jazz, contemporary to film music. He is a member of the Kaleidoscope String Quartett (Unit/Traumton), a group that, as a traditionally “classical“ ensemble, is also able to position itself within the realm of jazz and improvised music. A sought after studio musician, David Schnee did recordings for a multitude of Swiss and international film music scores, as well as for numerous jazz and pop bands. In 2013, he founded the Ensemble Cinéphonique, which specialises in recordings for film, media and pop. As a founding member of the Galatea String Quartet, he was touring regularly and worldwide from 2005 to 2013. The Quartet won several prices at international competitions, as well as a prestigious ECHO prize in Germany. David Schnee lived in Berlin for 5 month in 2013 with a residency of the Zurich Arts Council. Nicola Romanò, born in Lucerne, Switzerland, in 1974. From an early age, Nicola has developed a close association with chamber music, which has since become the centre of his musical orbits. For many years, he has performed concerts with Lucerne-based Dreilindenquartett as well as with the ONYX Quartet and the Basel String Quartet. Since 2004, Nicola has been a member of the “ensemble für neue musik zürich”, which is celebrating its 30th anniversary this year. With “klangcombi”, a quintet dedicated to innovative Swiss folk music, he has found the perfect musical paddling pool, in which he enjoys maximum stylistic freedom and openness. Together with LAUS and the Trabant Echo Orchestra, Nicola has been exploring and experimenting with musical arrangements which straddle the interface between serious and light music. Besides this, he has been busy giving concerts as part of various projects by the Swiss jazz and free improv scene. Nicola also teaches at the Uri School of Music (Musikschule Uri) and at Küsnacht High School (Kantonsschule Küsnacht). Beat Keller, composer, guitarist, multi-instrumentalist and bandleader based in Winterthur, Switzerland. After graduating as a jazz guitarist from the Zurich School of Music and Drama (Hochschule für Musik und Theater Zürich), Beat Keller obtained a Master of Arts in composition from the Lucerne School of Music (Musikhochschule Luzern). Among his current projects are Keller's 10, Gunfire Orchestra (CH/NO/SA), Bowee/Keller (CH) Beat Keller & Reza Khota (CH/SA) and the Peckinpah Trio (CH/USA). His compositions have been played and recorded by NDR Bigband, Lucerne Jazz Orchestra, Ballbreaker Ensemble, Composer's Group Ensemble and Keller's 10. Beat Keller has given concerts all over Switzerland, in neighbouring Europe, the United States and South Africa. Record releases on: Unit Records, Alpinechic (both CH), Edition Wandelweiser Records (DE) and Silken Tofu (BE). Selected discography: Keller's <10> (2008), Keller's 10: TWO (2013), Beat Keller & Reza Khota play 11 Microexercises by Christian Wolff (2013), GunfireOrchestra: Unstable (2014). He has been supported and awarded with various grants and awards. Joseph Kudirka, born in Grand Rapids, Michigan, USA. Has at other times been a resident of the UK and Switzerland. Studied composition with Michael Pisaro, Alan Stout, James Tenney, and Bryn Harrison. Works have been performed world-wide, including works commissioned or premiered by Ensemble Neue Horizonte Bern, wandelweiser komponisten ensemble, Zinc & Copper Works, edges ensemble, Rhodri Davies, Daniel Plöger, Philip Thomas, and Anton Lukoszevieze. As a performer, has premiered many works, including contrabass solos by Antoine Beuger, and Michael Maierhoff." 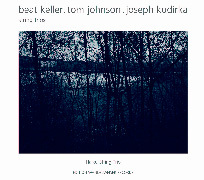 Tom Johnson, born 1939 in Greeley, Colorado, is an American minimalist composer, a former student of Morton Feldman. Village Voice music critic and modern composer Tom Johnson has published two books, and created over 70 musical works, including for piano (1971's "An Hour for Piano"), with text (1987's "Eggs and Baskets"), for radio ("J'Entends un Choeur," 1993), and, most notably, opera. After obtaining his undergraduate and master's degrees from Yale, Johnson studied some with composer Morton Feldman, and has since composed for a variety of settings. His most highly regarded opera, "The Four Note Opera," has gone on to be performed dozens of times, and in a number of languages, since its 1972 premiere. Another oft-performed work is "Failing: A Difficult Piece for Solo String Bass," which requires the performer to speak throughout the already- challenging composition. While living in New York, Tom Johnson wrote about modern composition for The Village Voice from 1972-1982, before moving to Paris, which has been his home since 1983. His articles for the New York paper can be found in the book The Voice of New Music (Apollohuis, 1991). Johnson also wrote a book on his music theories, Self-Similar Melodies (Editions 75, 1996).